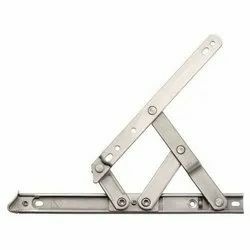 Size (inches) 12", 14", 16", 10"
We are Dealing in Stainless Steel Friction Stay offer improved security and weathersealing through the use of a reduced friction, nylon end cap. Stays have been designed to offer smooth closure and high performance for window applications of all sizes. Supplied with packers to adjust stack height. 2. SS 202,SS 304 graded and Brass material for anti corrosion leads to long life. 3. 2.5 mm thickness Stay and 0.8 mm of bottom and SS stripper in rail. 4. Weight carrying capacity more than 20% increased due to the formation in Stay. 5. All rivets and screws are only in graded Brass. 6. Poly propylene derlin material used in stopper, rail and end cap to withstand in life time. 7. Fully buffed finishing for exclusive appearance, available only in VEE VEE MEX. 8. Sizes available from 10” to 16 “. 9. Suitable for Indian weather condition and consistency quality and specification in life time. 10. Easy to fit and Zero TO 90 degree open able at any angle.